Papaya trees are susceptible to transplant shock. A papaya tree can die easily from being transplanted under a sunny sky if the root system experiences some damage. New transplants with damaged roots usually begin to wilt within seven days of being transplanted during a non-rainy period. Most papaya growers start their papaya seedlings in plastic pots and transplant them straight to the ground with virtually no disturbance to the roots. However, keeping the roots undisturbed is next to impossible you are digging up a papaya tree that is too large or grows too close to other trees. Papaya trees can be easily damaged during the transplant process. Wait for a heavy rainfall. Rainfall increases the cellular turgor pressure, which is essential to keep a papaya tree alive. Papaya trees lose cellular turgor pressure during transplantation under a sunny sky. It is better to wait until it is raining, particularly if you cannot guarantee the root system of a papaya tree will remain unscratched throughout the transplantation process. Identify which papaya trees can be transplanted safely during a heavy rainfall. 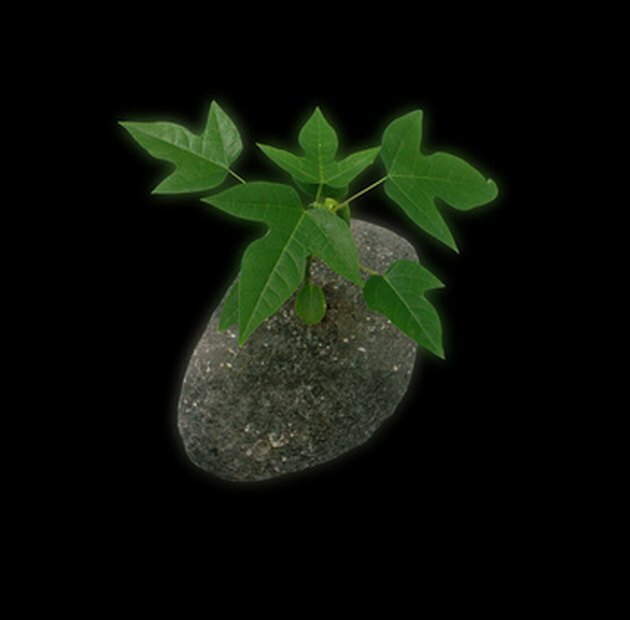 You can transplant a papaya tree with this method if it has grown at least four true leaves. In addition, it should be raised up in an open sunny spot. Dig out the papaya tree with a shovel, and keep as much the root ball as possible to minimize root injury. The root ball should ideally be as wide as the root spread. Since the root spread of a papaya tree planted on the ground is about as wide as the spread of the leaves, some root damage is inevitable if the papaya tree you are digging out is too large. However, a papaya tree with severely pruned roots can survive nicely if you complete the transplantation process before the rain stops. Tease the roots of neighboring papaya trees apart with your fingers. If the roots become entangled with each other, consider washing away the soil sticking to the roots until they can be physically teased apart. Replant the papaya trees in a new location with spacing about 4 1/2 feet apart. Dig a hole for each papaya tree you are planting. The hole should be deep enough to contain the roots and about twice as wide as the root spread. Fill the hole part way with excavated soil. Place the papaya tree in the hole and use one of your hands to support the tree in an upright position. Back fill the hole the rest of the way up with excavated soil. Firm the soil surface with your hands to eliminate air pockets. Mulch the area around the newly transplanted papaya trees with dead leaves or other pest-free organic matter. The mulch layer is intended to protect the soil from being washed away by rainfall. The thickness of the mulch is not important at this stage. The mulch must be pest-free because the movement of soilborne insects can potentially cause disturbance to the roots. Irrigate the newly transplanted papaya trees at two-day intervals during a non-rainy period. The roots of a papaya tree are fragile. It is important not to flood a newly transplanted papaya tree with too much water until its root system becomes well established. Water the newly transplanted papaya trees with diluted soapy water if soilborne insects threaten the plant growth. Diluted soapy water can drive the soilborne insects away without killing the papaya trees. Monitor the plant growth and regularly check if the newly transplanted papaya trees grow any new leaves. Under normal circumstances, new leaves should emerge from the top bud within four weeks. If that is the case, then the transplantation is successful. If not, continue to care for it as usual until it is dead. A near-death papaya tree can miraculously recover in another rainy day. Kim Yun has been a freelance writer since 2008, composing articles on gardening, self-sustainable living, travel, science, health/fitness and business finance. Her articles appear on websites such as eHow. Yun holds a Doctor of Philosophy in quantum physics from the University of Leeds, U.K.